Simply upload your tools for Revit® and always work with up-to-date versions, try out other AGACAD products, get the newest information and help – all of this is just a few mouse clicks away. TOOLS4BIM Dock is a new interactive window in Autodesk® Revit® that you can use to access and manage all AGACAD developed Revit apps and BIM solutions. This tool manager is very practical and a powerful way to simplify Revit apps installation, activation and usage. Formerly, by the previous AGACAD product installation procedure, each tool for Revit had to be installed and activated separately. Moreover, Revit user had to keep in mind to close Revit before installing procedure. It is now possible to easily install any desired product or all of them at once. It is also very simple to activate tools: you just have to click the Activate button. No more serial numbers but activation codes instead. Store – access to all AGACAD TOOLS4BIM products at your workstation which makes testing and purchasing convenient. 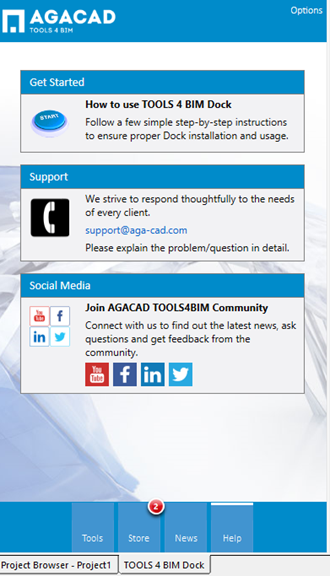 The Store dialog has an overview of all AGACAD Tools4BIM products. 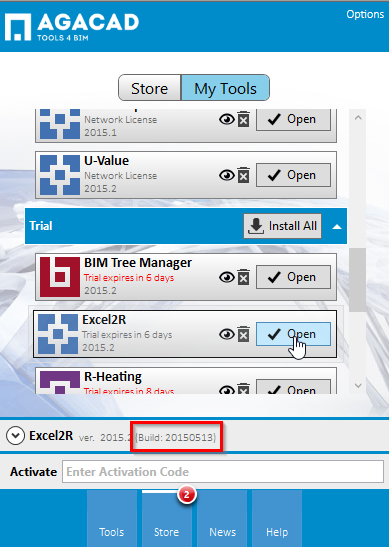 Here you can select any tool that you want to try and install it into Revit easily. Each tool has a short description with a link ‘Read more...’ that takes you to a detailed product description page. After pressing the ‘Get Trial’ button, Revit user immediately receives an activation code to his email inbox. He/she just needs to copy/paste the code to the activation box and the product will be activated immediately. By pressing the Buy button you can directly get from the TOOLS4BIM Dock dashboard to the AGACAD e-shop and buy desired Revit plugin. The My Tools tab is the environment where you can see all installed tools (purchased license or trial). In this area you can see which products are already downloaded or activated, whether it’s a trial or product license, how many days you can even use them (when the trial, subscription or annual license will end) or do you need to update the product version. If there is any tool update or related news, a special icon (red bubble) appears near a particular product and the user gets notified which tool requires updating. This way, you can be guaranteed to you always use the latest product version. In the Tools dialog you can find Product menu of trials or purchased tools and use all of them in your projects. There is also a possibility to rearrange the tools the way you want to see them in the TOOLS4BIM Dock window. You can easily edit order of the tools and create desired tool groups in the Tools tab. You can hide some Revit add-ons if you know that they will be unnecessary during a particular project. You can also place some tools to the Ribbon or uninstall them if you think that you won’t need certain tools in the future. So, you can flexibly organize tools according your needs, so that you can use them conveniently. It is pretty simple. TOOLS4BIM Dock user’s manual is here > TOOLS4BIM Dock Getting Started. The News tab is committed to an RSS news flow from www.aga-cad.com. Here you can find out the latest news of the AGACAD company, messages about product updates, new releases, and tips & tricks. The Help tab – there you can make a support request directly from the Dock dashboard. Please explain the problem/question in detail. We strive to respond thoughtfully to every client’s need. Note: all data about your installed AGACAD products is automatically send together with your request letter. These details will help our support team to know what products you are using: this information can improve support speed and quality so please leave it in the request letter. Closest and fastest possible access to all AGACAD TOOLS4BIM products. Revit application management: you can easily view all your apps. You can clearly know what licenses you have, when it will expire, when you need to renew product versions. Get free trial of the product required in your project just in time. 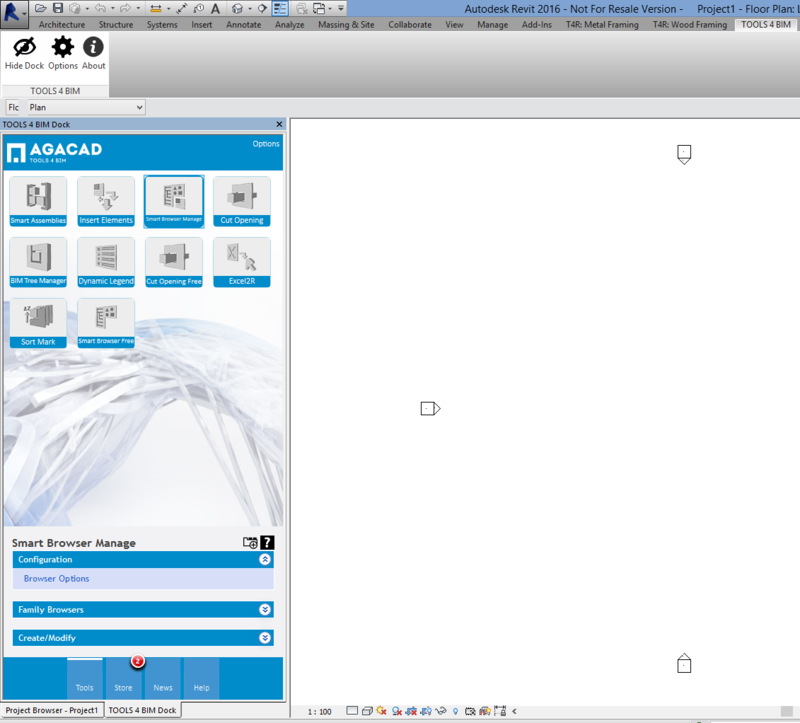 User-friendly environment: it is very easy to install and activate all AGACAD TOOLS4BIM product packs (or uninstall). You are always aware of the latest news. It is very easy to join to the Network license system through the Dock dialog. Professional, operative, individual support that matches the needs of your business. From now on, everything what you may need or know about AGACAD TOOLS4BIM is at your work place. We eliminate tasks that do not bring value. So that, you could spend all your time on your work.